This breathtaking garden was designed to be a cozy “Nantucket style”garden room for entertaining and seasonal interest. Building on features from the historic garden which once sat in this space, Kendall O’Brien created a walled garden room. The walls of green harbor a prominent English Urn alive with water and colorful summer annuals, and a lawn panel framed with true perennial gardens and an exquisitely detailed garden path. Ivy covered steel arches create the backdrop, reinforced with tall Chamaecyparis. This estate master plan transforms a two acre site into a series of interesting, versatile spaces. A kitchen patio was sited and designed to coordinate with adjacent interior design details. The patio/garden room includes a shaped flagstone patio, a water fountain, sculpted hedges, urns and perennial gardens. A path through rose covered arches connects the patio to the sun and shade perennial and cutting garden. 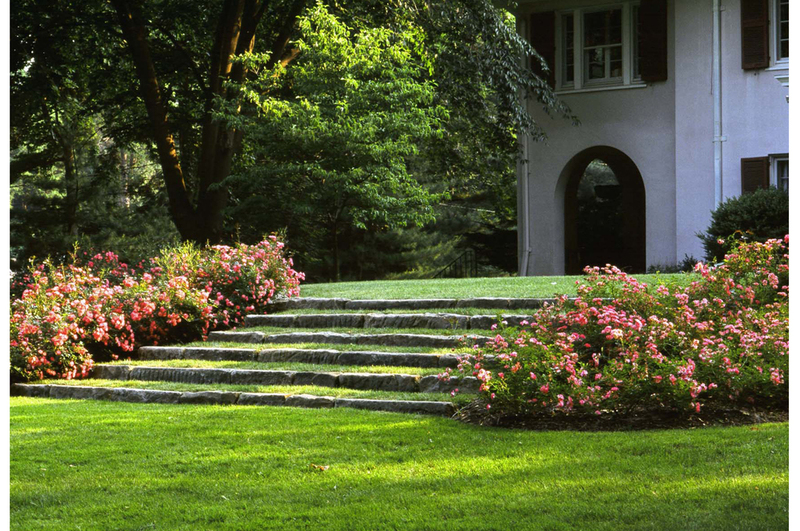 A bank in the rear was gracefully sculpted to include French lawn steps from the house to the yard. The days of the open lawn dictating the backyard gave way to an outdoor extension of the house in this project. Kendall O'Brien was hired to transform the entire property behind the house into several outdoor rooms that work as one and relate directly to the house and garage. The rooms encompass activities of all kinds, including swimming, cooking, formal and casual dining, sunbathing, showering, and relaxing in a hot tub or by the fire. It is a successful transformation of an urban space into an outdoor living space. Mature vegetation presented exciting challenges at this Virginia Manor home. Kendall O’Brien Landscape Architects was charged with transforming a wooded slope into a useable outdoor area. The finished property features a pool within a garden. 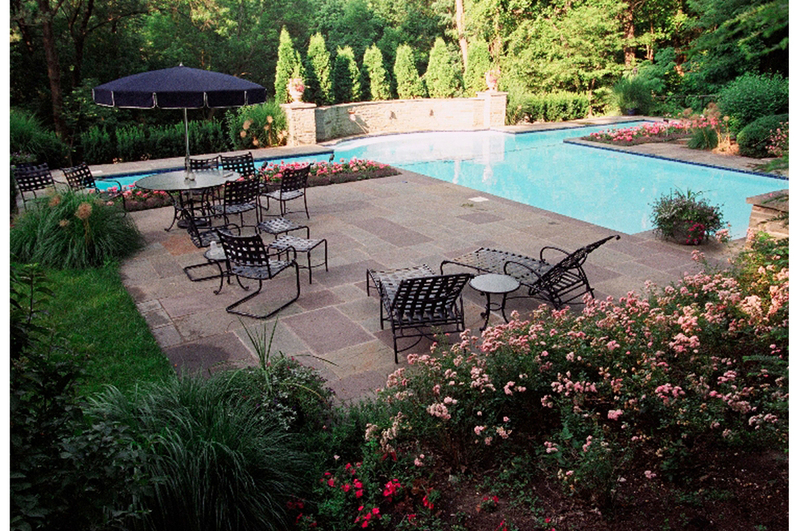 A 60’ lap lane is tucked amongst a perennial bed and a fountain wall which splashes into the main pool. An existing water feature transitions the existing patio to the rear garden pool area. Two level lawn spaces carved from the slope are now a crabapple walled sitting space and a large open lawn edged by the woods below. Remnants of the wooded site rest in a fern covered bank overlooking the lush garden pool.